(that's just £5 per month). Your banner links directly to your website. 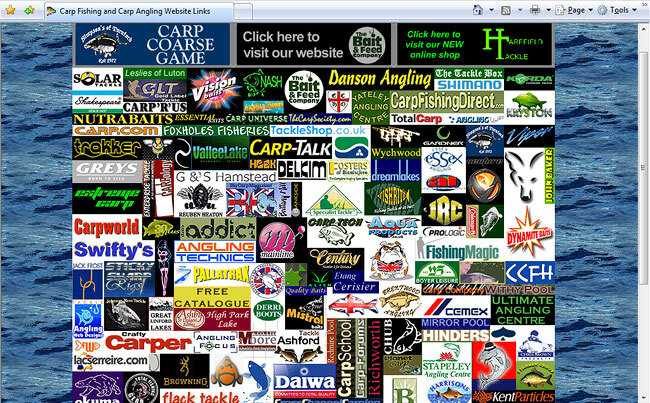 We advertise CarpWebsites.co.uk in the carp press and on the net. We send you a weekly statistics report. In 2008 we had a total of 210,660 visitors to the website. In 2009 we increased that to a total of 221,309 visitors to the website. 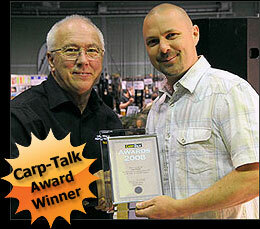 CarpWebsites.co.uk designer Richard Stangroom receiving Carp-Talk's ‘Best Angling Website' award. If you are an angling business with a website then you already understand the value and benefits it gives your business, and with the internet now playing an ever increasing role in most businesses marketing strategy, we would like to introduce you to . The main aims of this site is to give all our advertisers an equal opportunity of being found on the net (no more trying to get listed on the first page of search engines), and to provide visitors to the site with 'The ultimate links page to the best carp websites on the net'. Carpwebsites.co.uk is a website designed as the ultimate 'one-stop' link site to help carp anglers surfing the net find exactly what they want quickly and easily. Split into 6 clearly defined areas, carpwebsites.co.uk easily navigates visitors to a page of banners that link directly into websites of their particular interest. 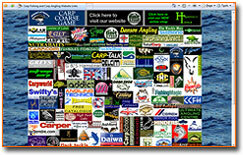 The website ‘carpwebsites.co.uk’ was initially set up in March 2006 as a logo driven visual links page to over 120 of the best carp websites on the internet. The site has been continually advertised in some of the monthly carp magazines as well as on many of the websites it already promotes. The site has proved extremely popular and received an average of 11,356 visitors per month over the 10 months between January and October 2007. It is due to this popularity that we decided to re-think our initial concept in order for it to be better laid out and easier navigated. Your banner will be added to our database for the particular category or categories relevant to your area of business. Each time a visitor to the website opens a category containing your advert it will appear on the screen. The system is set up to list all banners randomly so there is no set position on the page thus ensuring impartial, unbiased advertising. the number of visitors who have clicked on your banner. The frequency of this report can be altered at your request. Accuracy of the figures on the report can be checked against your websites own statistic package. Impressive Statistics - Are you missing out? 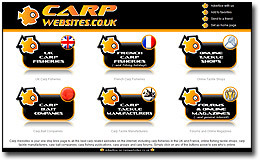 We re-launched carpwebsites.co.uk on Monday 12th November 2007. In 2008 we received a total of 210,660 visits - an average of 17,555 visits per month or 577.2 visits every day! The total Unique Vistitors was a huge 69,109. In 2009 we increased the total number of visits to 221,309 - or an average of 18,442 visits per month or 606.3 visits every day! The total Unique Vistitors also increased to 81,822! We expect these impressively high figures to continue as our advertising campaigns continues throughout 2010 - Are you missing out? 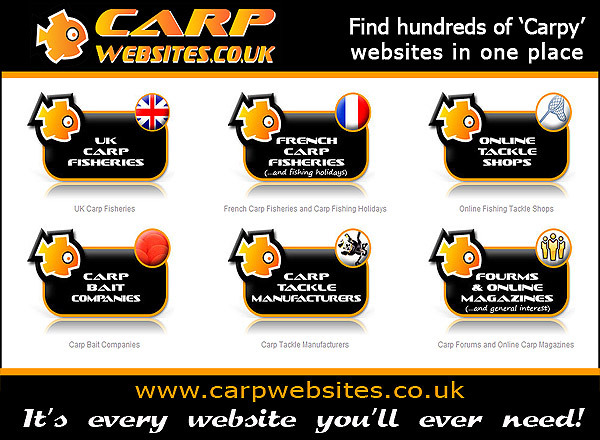 Carpwebsites.co.uk is already well ranked on Google and other search engines under numerous search terms based around the word 'carp', and the newly designed website has been developed to be even more ‘search engine’ friendly, employing all the latest Search Engine Optimisation methods. 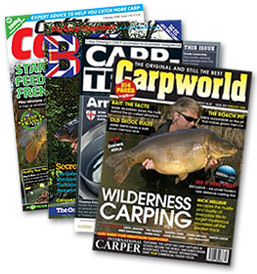 We have also already booked a 12 month advertising campaign with ½ page adverts in Carpworld, Crafty Carper and Big Carp magazines, and plan to run adverts in all of the monthly and weekly carp publications during 2009 - Where else can your website get that much exposure for such little investment? Having already advertised CarpWebsites for over two years, the first of our new 1/2 adverst were published in the December issues of Carpworld, Crafty Carper, Big Carp and Carp-Trade. Moves between a maximum of 3 messages. Increase your visibility by running more than one advert banner. If you wish to have your advert included in a 2nd category (or twice in the same category) you will receive a 15% discount on the total cost based on the prices above.The advert can be the same or different. If you are providing your own banner we will upload 2 changes in any 12 month period Free of Charge. There is no limit to how often you can supply us with new adverts but thereafter each additional upload will incur a £10 administration fee. Ownership of any imagery use in the banners supplied is the responsibility of the person creating the banner. CarpWebsites.co.uk and its creators accept no responsibility for any issues of copyright, Trademarks or Registered Trademarks.